A new piece for the HS Today website this time exploring the implications of Abu Qatada being featured in a number of videos or messages by extremists ahead of his possible expulsion from the UK. It looks more generally at the terrorist threat to the UK, something I explore in specific detail for the Olympics in the latest magazine (which is currently available here in the online version of the magazine, but has not been fully posted online yet. Will re-post once it is). In the meantime, all of this work on the UK jihad presages my long awaited book which should land soon. With menacing pomp and circumstance, Al Qaeda and five of its key affiliates have directly threatened the United Kingdom, this time specifically berating Britain for its treatment of Islamist prisoners. The new Al Qaeda threats — published on Islamist forums — once again underscore that the UK continues to be at the top of the terrorist group’s list of high-priority targets. And with the impending Olympics painted with a crosshair, the spike in Al Qaeda’s attention undoubtedly isn’t a welcome development to the occupants at Thames House or New Scotland Yard. Parsing threat from fiction is difficult, but this latest sustained series of threats highlights the fact that the terrorist menace facing the UK will not end at the same time as the Olympics’ closing ceremony on August 12. Numerous statements from Al Qaeda and its affiliates — the Islamist State of Iraq, Al Shabaab, Al Qaeda in the Arabian Peninsula and Al Qaeda in the Islamic Maghreb — all have warned the UK that it will suffer dire consequences if Palestinian cleric Abu Qatada is deported to Jordan for his involvement in a series of plots there. Known formally as Omar Mahmoud Othman, Abu Qatada was born in Bethlehem in 1960 and in the late 1980s ended up in Peshawar, where he is believed to have first encountered Al Qaeda. Although he claims that he was schooling Afghan children in Peshawar, according to Abu Musab Al Suri, a Syrian jihadist ideologue also in Peshawar, Qatada was an active proselyte with many followers who in 1992 elected to cross the border into Kabul. Within a year, though, he was among a number of extremists who were evicted from Pakistan as part of a wider push by the Pakistani government to try to rid itself of the troublesome jihadi contingent that had lingered in Pakistan and Afghanistan in the wake of the fight against the Soviet Union. “Al Qaeda sold everything in Peshawar,” according to an Egyptian Islamist who was around at the time, adding that Osama Bin Laden had led a contingent of fighters to Sudan where he established his base of operations for the next few years. For Qatada, the UK was more appealing, and on Sept. 16, 1993, he showed up in London claiming asylum after having entered the country on a false Emirati passport. Once in Britain he established himself as a cornerstone of the global jihadist scene, becoming editor of Al Ansar, the fiery Islamist newsletter supportive of jihad in Algeria at the time. Not bad for a man on welfare supporting jihad through long-distant financing. Qatada served as a beacon for global jihadists. One young Muslim Londoner told Homeland Security Todayabout attending a meeting hosted by the preacher in the late 1990s at which one-legged and one-eyed men would attend in combat outfits, clearly fresh from fighting abroad. Djamel Beghal, a charismatic Algerian who helped recruit shoe bomber Richard Reid into the Al Qaeda fold while he worshipped at the Finsbury Park mosque, first came to the UK to specifically study under Qatada. Many of Qatada’s books, recordings and publications are venerated among the extremist community as justifications for violence, and he’s reported to have been teacher to both hook-handed Abu Hamza (his favorite student), and Abdulla El Faisal (the anti-Semitic preacher whose cassettes Mohammed Siddique Khan liked to collect and who currently continues to preach from his residence in Jamaica). Recordings of Qatada’s sermons were found at the house of September 11 jihadists, and in 2004, the Spanish Al Qaeda cell responsible for the Madrid bombings a few days earlier attempted to call Qatada prior to blowing themselves up to avoid capture by Spanish authorities. They sought, and apparently got, sanction from Qatada to carry out their suicidal final act. It comes as little surprise that such a popular preacher would inspire statements from the extremist community when it seems he might finally be deported to Jordan where the government is likely to punish him for his actions. TTP told Britain to treat its prisoners better, referring to the cases of Bilal Abdulla, the Iraqi responsible for the 2007 attempted attacks in central London and at the Glasgow airport; Roshonara Choudhry, the young woman who tried to stab MP Stephen Timms; and Dhiren Barot, a senior Al Qaeda figure who planned unknown attacks in the UK. Equally worrisome for the UK is that if jihadist groups are going to start venerating all jailed British jihadists in this way, then the United Kingdom is going to have to worry about terrorists seeking revenge for decades to come. Barot, for example, was given 40 years in jail, and since then nearly 200 others have been sentenced on terrorism charges. While there are a few notable examples of individuals de-radicalizing while inside prison, there is just as much evidence that others are either emerging more radicalized or continue to believe the ideology they harbored when they went in. In the recent case of a group who pleaded guilty to trying to detonate a bomb in the London Stock Exchange, one of the key figures was a convicted petty criminal who was reported by neighbors to have been released from prison radicalized. Compounding the problem is the international community of Al Qaeda-affiliated groups that has decided to take up the cause of the jailed British terrorists by providing them with sustenance and support while they’re doing their time behind bars. This very likely will extend a problem that Britain’s security services are expecting to stop focusing on in the wake of the Olympic Games. Terrorism in the UK may have burst into Britain’s consciousness on July 7, 2005, the day before the awarding of the Olympics to London, but it isn’t going to end on Aug. 13, 2012. 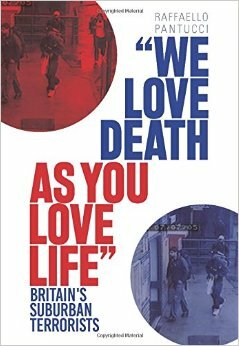 A frequent contributor to Homeland Security Today, Raffaello Pantucci is an Associate Fellow at the International Center for the Study of Radicalization at King’s College, London, and author of the forthcoming book, “We Love Death as You Love Life:” Britain’s Suburban Mujahedeen. My contribution to the post-Inquest analysis into the July 7 bombing in London, this time for HSToday (looking back, I have been covering this lot since May 2008). This focuses on the training camps element, the group of older radicals around which the group was congregating in Northern England – detail on which has emerged during the Coroner’s Inquest. Lots of interesting information to come out during the hearings, all of which is complicating my book as it has added a whole new wealth of stuff I need to include. More on that soon! Poring through the mountain of information that’s been published in the wake of British Coroner Lady Justice Hallett’s inquest into the July 7, 2005 bombings in London, many surprising new pieces of the plot puzzle have been revealed. One particularly interesting piece offers insights that US counterterrorism and law enforcement authorities might want to learn from. It seems that the Islamist community out of which the July 7 team of terrorists emerged drew their inspiration from a group of older radicals who’d fought in jihadist battlefields abroad. This disclosure highlighted the risk that’s posed by older jihadists in radicalizing new generations of fighters, and serves as an important lesson for the United States with regard to leaping to conclusions that condemn entire communities of Muslims. These plots tend to emerge from particular networks – focusing attention on them is the most productive way to counter terrorism at home. According to newly published information from Britain’s domestic intelligence agency, MI5, and the West Yorkshire Police, July 7 bomber Mohammed Siddique Khan first appeared on counterterrorists’ radar in 2001 during an investigation codenamed Operation Warlock. This was an investigation that had been launched to try to piece together what, exactly, was going on and who was present at an outward-bound terrorist training camp under surveillance in Britain’s rural Lake District. Khan was photographed as one of the participants, though it was only years later that authorities identified him. One of the trails of evidence that initiated investigation of the jihadist training camp was the activity of an individual named Martin “Abdullah” McDaid, who is a convert to Islam who’d claimed to be a former member of Special Forces. He was one of the organizers of the terrorist training camp, and according to newly released information, he’d been on MI5’s radar since 1998. Based on intelligence, the West Yorkshire Police identified McDaid and fellow convert, James McClintock, a 44-year-old father of four from Dundee who’d converted to Islam in his 20s and changed his name to Yaqub Mohammed, was apprehended in Afghanistan in Dec. 2001 on suspicion of being a foreign fighter. Dubbed the “Tartan Taliban,” he was released a month later after repeatedly claiming he had no ties to terrorist organizations. He returned to the UK. McLintock also was detained in Manchester in 2003, but was released without charge. He again was apprehended in early 2009 in Peshawar, Pakistan. Based on recently released information, McClintock reputedly had achieved a high status among local Muslim communities in Northern England for his involvement in the Afghan war against the Soviets, and later during the conflict in Bosnia. According to McClintock, he was on his way to Pakistan to meet a friend when he met young Saudi’s on their way to jihad in Afghanistan who persuaded him to join them. Less is known about McDaid, but one former radical Homeland Security Today interviewed said he recalled meeting McDaid at the Central Mosque in Leeds and found him to be a hard-line salafi-jihadist. According to a former senior police source, both McDaid and McClintock were figures of interest based on their travel patterns and connections, but that there was never any evidence obtained that would hold up in court. Nevertheless, McDaid’s activities in helping run training camps reputedly was of such concern to one counterterrorist official that in 2002 they leaked the information about him to the Times – though nothing ever came of the tip. A third organizer was a local Pakistani-Briton named Tafazal Mohammed, also known as “Tafs.” Additionally, there was a reference to a mysterious convert named Max Gillespie, or Abdul Rahman. Both were suspected of not only running the training camps, but having established a series of bookstores in Beeston out which they are suspected of having assisted in running study groups and carrying out respectable social work among the community and developing protest materials for dissemination. Also part of this web of connections was Mohammed Siddique Khan and his friends, all of whom are reputed to have sought to do more with their lives than the limiting parameters they found in the world around them in an impoverished Leeds suburb. Khan and one of his fellow bombers went so far as to become trustees at one of the bookshops established by Mohammed and Gillespie, though by the time of the bombing they’d moved on. From the springboard of the network that these men cast, the young radicals moved up the chain to connect with networks in London already in direct contact with Al Qaeda in Pakistan. They were able to go on at least three or four separate trips to Pakistan to train. While it’s unclear whether it was McDaid, McClintock or “Tafs” who provided the men with the connections, it’s known that a key Al Qaeda facilitator in Luton, a city on London’s outskirts, had called telephone numbers connected to Khan from one of the bookstores that the men had established. This mysterious link to Al Qaeda seems to have been the person who sent Khan and a fellow aspiring jihadist on a “fact finding” mission to Afghanistan in 2003 to supposedly discover the truth of what was happening in the war. But the real point in all of this is the fact that not only was Khan on the radar of security services as part of another Al Qaeda linked cell that was trying to plot an attack, but he was part of a community that was motivated by a group of older radicals with field experience. This is an all-important detail when considering how to cast a net of suspicion over communities in the manner that Rep. Peter King did during his recent hearings on radicalization in US Muslim communities. The truth is it is a very small and focused portion of Muslim communities that are involved in radical activities. Focusing on them should be the purpose of counterterrorism efforts, rather than the catch-all approach that seems to be favored by King.